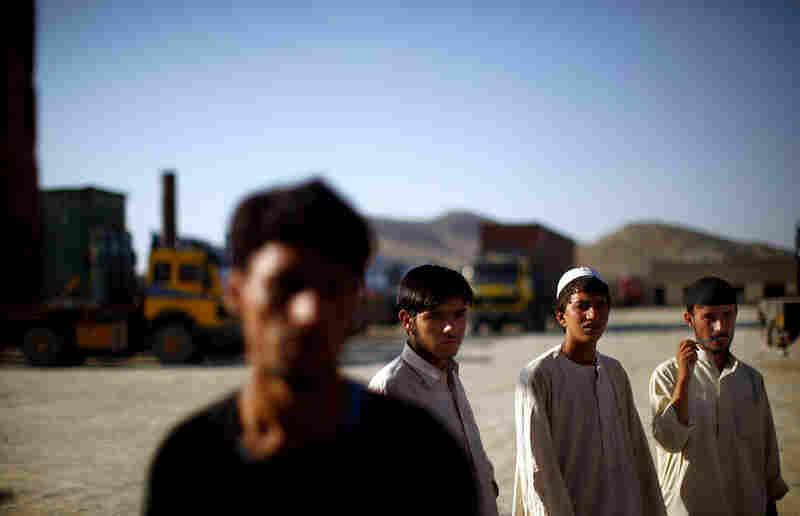 In Afghanistan, Trucking Can Be A Deadly Business Shafi Noorzi's main client is the U.S. military. His trucks carry things such as construction equipment, air conditioners and food destined for U.S. troops in violent areas such as Kandahar. The convoys of 18-wheelers have become favorite targets of the Taliban, who might stop them, demand money, set the trucks on fire or worse. 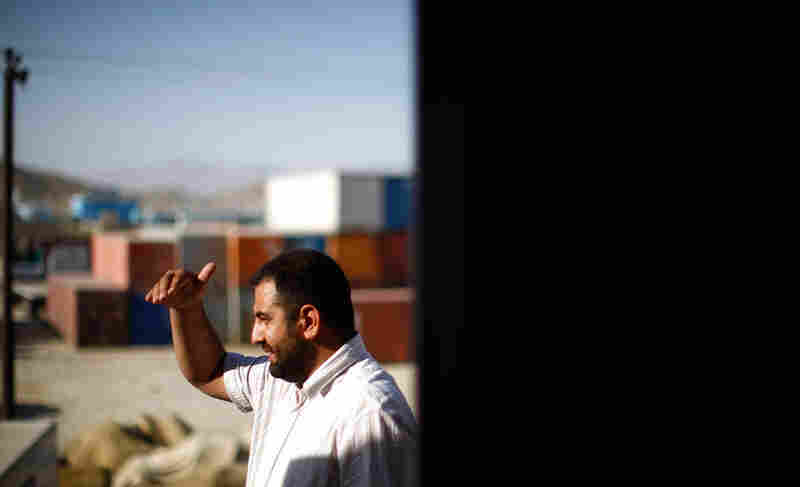 Shafi Noorzi looks out over his truck terminal from the dispatcher's office in Kabul. 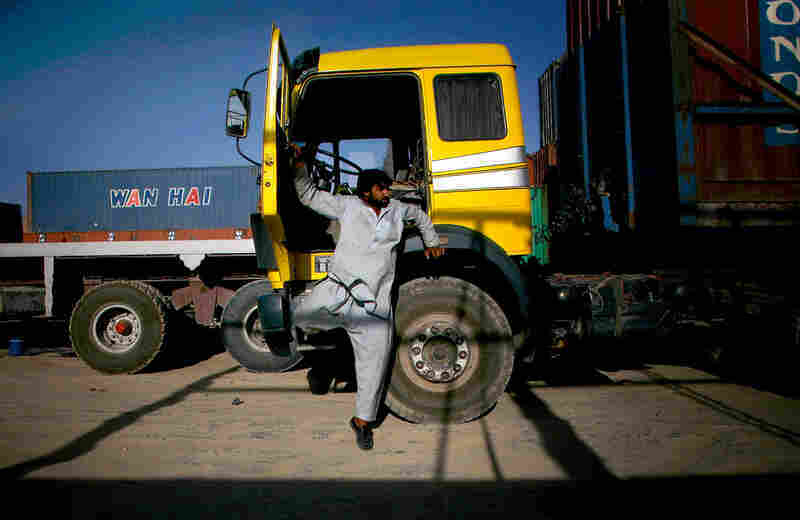 Driving a truck in Afghanistan is a dangerous, but lucrative business. Shafi Noorzi's employees look over the incoming fleet of trucks. One of about 200 employees who works for Noorzi backs up his truck. Noorzi's client list includes major military bases in Afghanistan. Truck drivers making deliveries to U.S. bases are often stopped and threatened by Taliban insurgents. I first spotted Shafi Noorzi playing volleyball in the backyard of a house NPR had rented in the winter of 2001. Noorzi worked at the NPR house as a cook, supporting his parents, eight siblings and his widowed aunt. His story was typical: His father ran a successful business importing clothes before he lost everything in the fighting between warlords that destroyed Kabul after the Soviets left. The comfortable life of his childhood long gone, Noorzi was willing to do anything when NPR offered him a job cooking for the reporters coming to town. The house had no electricity in the cold winter, and no water in the sweaty summer, but he served up memorable fried chicken, tangy tomato salad and slices of fresh mango almost every night. He remembers being happy, but also looking to do better. When NPR gave up the house a few months later, he got work with the United Nations as a driver, and because his English was so good, Noorzi was promoted to secretary. "When I went to sign my contract, my salary was $600 dollars; $600!" he says. "It was like a dream for me." And then a real opportunity came along: The procurement officer was out one day, and the boss asked Noorzi to round up $3,000 of concrete blocks. He managed to buy the entire load for half the price. Next thing he knew, he was in the procurement office at more than twice the salary. It was the experience procuring goods and services for the U.N. — where he quickly proved talented at managing contracts — that led Noorzi to acquire four trucks of his own by 2004. "Most of the time, I remember that I didn't eat because I was too busy, just drinking water or juice," he says. One of his fond memories: Someone asked him for Coca-Cola. He thought they needed it for an office. "When I put it on his desk, he said, 'OK. How many of these you can bring?" I said, 'You need it for your office, so I can supply you. No problem.' He said, 'No. We want to purchase it. Can you give us 2,000 cases?'" Noorzi quickly arranged a supply of 2,000 cases, almost a container, of Coke, Fanta and Sprite. His customer: The U.S. military. "When I offloaded the trucks, they told me can you bring 5,000 more?" he says. In a little over a month, Noorzi says he supplied 110 containers of Coke, Fanta and Sprite for the U.S. military. Today, Noorzi has 200 employees and 70 trucks. He also owns several houses for his extended family. Noorzi is now rich. His military contracts mean big money — and they also mean big risk. His trucks carry things such as construction equipment, air conditioners and food destined for U.S. troops in violent areas such as Kandahar. The convoys of 18-wheelers have become favorite targets of the Taliban, who might stop them, demand money, set the trucks on fire or worse. "We receive the warnings by phone in Kabul," Noorzi says. "Warnings from Taliban." They threaten him and his drivers with death for working for the U.S. military. Noorzi says he pays between $2,000 and $3,000 to recover the bodies of slain drivers from militants. He also says he has a contract with his drivers — should they die while working, their families each get $8,000. 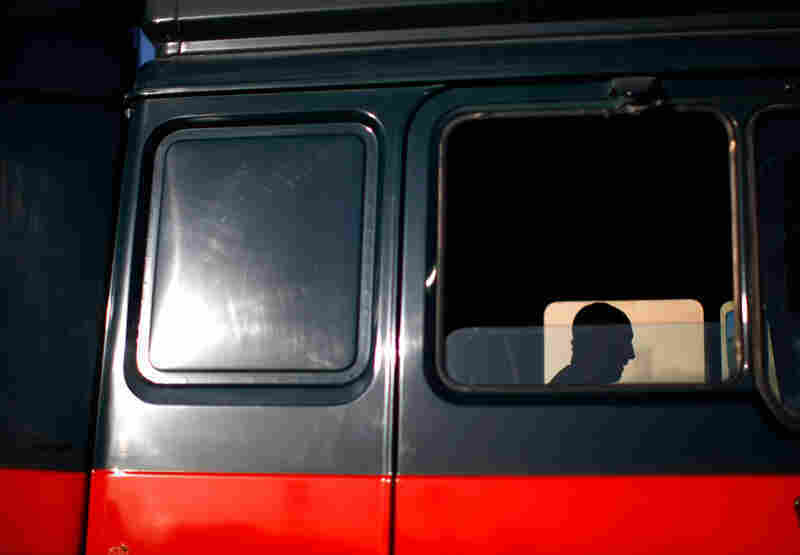 In 2006, trucking companies began adding armed escorts to their convoys. It doesn't always keep them safe. Just last week, the Taliban managed to stop one of Noorzi's trucks in Kandahar. The driver was carrying delivery papers for the U.S. military. He was killed. Noorzi says peace will help him and businesses like his in Afghanistan. "There will be highways between north and south, between countries. My trucks will work," he says. "I will not be worried about the security, about Taliban, about nothing! You know?" He also seems undeterred by the prospect of losing his biggest client. "I'm a trained boy, I can cook, I can work for United Nations," he says. "So at least I will make some money for my family — but I will have peace. My people will stay in peace."